Did you say you wanted more photos of my toes??!!??! 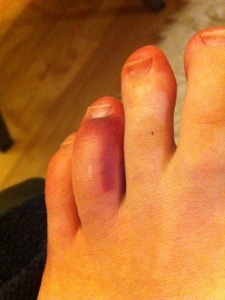 Sooooo, I was cleaning the house today and I whacked/wrenched my toe against a swivel chair so hard I sprained it. Three days before tryouts, nooooo! I was worried I might have done something truly horrible to it, given how janky it felt, but initial prognosis is sprain and that works all right with me. Toes hurt like a beast, but on the plus side it’s forced me to put more weight on my back wheels and I think that’s helped my crossovers (although my agility’s not so good right now). I do whimper like a sad puppy when I put my skates, but hopefully it’ll be better by tryouts. In other exciting news, Kate from PFM gave me a Lego doll avatar as a bacon camp graduation present. I am quite chuffed. Behold the Liz! Behold the Liz fighting the fierce purple monster!